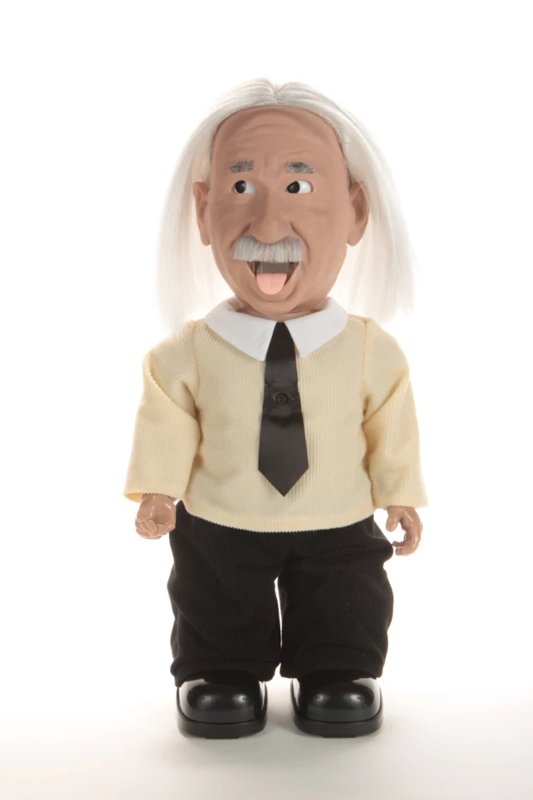 Hong Kong (PRWEB) January 23, 2017 — Today Hanson Robotics launched a Kickstarter campaign for an uncannily human-like robot version of Albert Einstein. The company aims to honor the iconic and imaginative scientist and bring fully expressive robots direct to consumers. Professor Einstein is a 14.5” personal robot with the ability to walk, hold a natural conversation, learn your name, maintain eye contact, answer questions, entertain and teach science. He’s cloud and Wifi connected, allowing for dynamic interaction with a tablet and the corresponding Stein-O-Matic app to learn and play games. The robot guides users through the world of science and beyond by presenting interactive lessons, eye-popping slideshows, daily mental kick starts, thought experiments, jokes, brain games and more. With new activities added to the Stein-O-Matic every day, Professor Einstein’s robust reward system allows users to earn IQ points, which can be used to unlock special items, bonus games and avatar upgrades. The idea for Professor Einstein was born out of toy inventor Andy Rifkin’s lifelong fascination with all things Einstein, and the values he stood for. Hanson Robotics founder and CEO Dr. David Hanson approached Andy about teaming up to create a robot, which led to the formation of a unique shared vision. Rifkin was invited to join as Hanson Robotics’ Chief Technology Officer and the robot was developed under the Hanson Robotics umbrella. The Professor Einstein Kickstarter campaign runs from January 23 – February 27, 2017. Early bird pricing starts at $249 USD. For a full rundown of the pledge levels visit the Kickstarter page. Dieser Eintrag wurde veröffentlicht in Crowdfunding, Education & Studies, English, Fun, General und verschlagwortet mit Einstein, Hanson Robotics, Kickstarter, Science von Sebastian Trella. Permanenter Link zum Eintrag.